Questions on how to structure a military that incorporates Burma’s ethnic rebel armies are raised during a meeting between political leaders and an ethnic alliance. CHIANG MAI, Thailand — The question of how to structure a future military that incorporates Burma’s ethnic rebel armies was raised during a meeting between leaders of the country’s political parties and an ethnic alliance of armed groups in Chiang Mai, Thailand, on Friday. Eleven senior political parties’ leaders from Burma arrived in the northern Thai city on Thursday evening for a two-day meeting with an alliance of 11 ethnic rebel groups known as the United Nationalities Federal Council (UNFC) and civil society organizations in Thailand. Despite having been invited, the ruling Union Solidarity and Development Party (USDP) did not attend the Chiang Mai meeting. “We were able to share about our armed struggles and our views on the federal union and they shared their views with us too,” said Nai Hong Sar, secretary of the UNFC and vice chairman of the New Mon State Party (NMSP). Both sides said the meeting was a step toward further talks aimed at reaching a lasting peace in war weary Burma. The meeting marked the first formal sit-down between political parties’ representatives and rebel leaders, organized by the government-affiliated Myanmar Peace Center (MPC). During a half-day meeting on Friday, discussion turned to the creation of a federal army. The Kachin Independent Army’s Gen Sumlut Gun Maw laid out the ethnic groups’ policy on a federal system of governance for Burma and the federal army that the UNFC hopes will result from ongoing negotiations. “Gen Gun Maw did not say that the current Tatmadaw [Burma military] has to be abolished. He accepts that there must be one sole army for a nation,” said Myo Nyunt, who was among those raising the federal army issue at Friday’s meeting. Gun Maw on Friday said the KIA has been discussing the integration of ethnic armed forces with the Tatmadaw since 2009. The KIA leader added that the military recruitment process should be reformed to accommodate the integration of ethnic commanders and senior soldiers into a federal union army. “He [Gun Maw] said the principles of the [current government] Army, such as the recruitment process, need to be reformed under a federal union,” Myo Nyunt said. 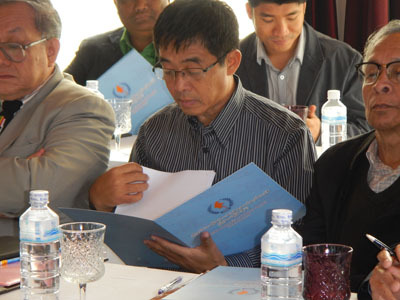 Political leaders in attendance said they looked forward to further collaboration as the peace process moves forward. Khing Maung Swe, the chairman of the National Democratic Front, invited the ethnic leaders to come to Rangoon for a future meeting. “Party leaders are willing to meet the UNFC leaders to find a way to help build trust for a political dialogue,” he said. Abel Twet, the vice chairman of the UNFC and chairman of the Karenni National Progressive Party (KNPP), in an opening speech highlighted the importance of reaching a genuine peace for internally displaced persons (IDPs) and others who have been living in conflict regions for decades. “The meeting clarified a lot of our concerns about the current political and military affairs,” she said. “The federal union policy is now no longer a taboo topic, and the same will be true for the policy of a federal union army in the future,” she added. Senior politicians on Friday afternoon also met with leaders of the Restoration Council of Shan State (RCSS), which is not part of the UNFC alliance, and representatives of the Thailand-based Women’s League of Burma. On Saturday, the group will meet with Shan communities based in Chiang Mai.